Order Now... SHIPS TODAY with FREE SHIPPING! The KR Strikeforce Cruiser Single Roller has been designed and assembled in the USA! 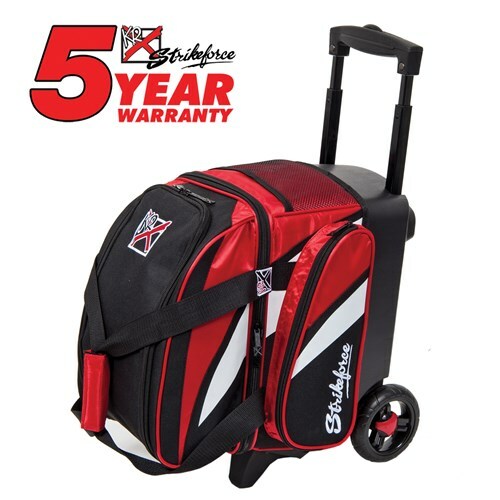 This bag is great for a bowler who only needs one ball and a pair of shoes for bowl night. Retractable Square Locking Handle Extends To 39"
Dimensions: W 10" X D 17" X H 20"
I bought that product in December of 2017. It fits perfectly for myself. I can put bowling ball and shoes just for a single person who can go have fun bowling. It doesn't matter if you are in a league or not. Good Question! Here is the wheeled bag warranty that is stated on KR's website: "This warranty applies when this product has been reasonably maintained and not subject to damage by misuse or abuse. This warranty does not cover damage incurred from transportation by commercial travel (air, train, bus, etc.) We will repair or replace under the terms of this warranty, any wheel product manufactured by Strikeforce Bowling, which proves defective in materials and /or workmanship, with another product of equal value." Hope this helps! Hello. For this product, you can use our 'instant5' promo code. It will give you a $5 coupon. We only offer Express International shipping, and it usually ranges from 2-5 business days. Due to the time it takes to produce the KR Strikeforce Cruiser Single Roller Red/White/Black ball it will ship in immediately. We cannot ship this ball outside the United States.